Are We Really Prepared for the Worst? Guest Blogger Matthew Brentzel takes a look at the capabilities of U.S. Weapons of Mass Destruction (WMD) response teams. Every so often, I look back on those horrific atrocities committed on September 11, 2001. I remember being in middle school, where the teachers were reluctant to inform us of what was going on. I also remember the news stories questioning the capability of our country to deal with such a catastrophe. Although we are surrounded by fear and uncertainty in trying times, we can always find relief by looking towards the brave men and women that put their lives on the line for the good of our country. Events like this have occurred before. I’ve heard stories from my grandparents about Pearl Harbor and the impact it had on history. We can all agree that these events were truly awful, but we must also accept the fact that we live in troubled times and events like these may be minor compared to the crises that could occur. Are We Prepared? 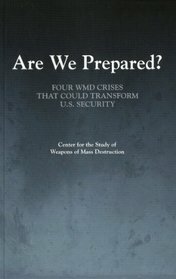 : Four WMD Crises that could Transform U.S. Security, by the Center for the Study of Weapons of Mass Destruction takes a stab at discussing this heated topic in a serious but effective manner. I really want to stress “serious, but effective.” Through a series of four crisis scenarios, Are We Prepared? looks at such issues as nuclear proliferation, the release of chemical weapons, and even a nuclear explosion in a major city. Perhaps most of us are more inclined to worry about preventing these events rather than preparing to respond to them, but there are times when prevention is not enough and response is necessary. While reading this book, at first I was taken aback by its willingness to accept the possible losses in one of the scenarios, but this approach enlightens the reader by stressing the high importance of applying appropriate countermeasures. This clear, concise report delves into four different crisis simulations in detail, including preventative measures and how we can be ready to counter such events. It also goes on to discuss the policy implications of each of these crises for the United States as a whole. If you are interested in politics or international relations, you can find this fascinating book on the US Government Printing Office online bookstore or browse it in a library.